Sprint today announced new two new mobile plans, both of which come with a new Unlimited Guarantee, ensuring unlimited talk, text, and data on the Sprint Network for the life of the cellular line. 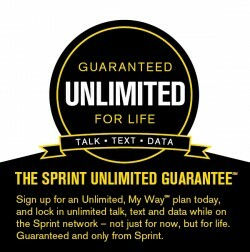 Sprint's guarantee applies to new and existing customers who choose to sign up for the "Unlimited, My Way" plan or the "My All-in" plan. The Unlimited, My Way plan offers customers unlimited usage for $80 per month for a single line, though additional lines (up to 10) can be added with a tiered fee that decreases based on how many lines are added. For example, a single phone with unlimited everything costs $80 under the new plan, but four phones will cost $260, or $65 each. - Customers first select the number of lines; all lines come with unlimited talk to any wireline or mobile phone and text. - Customers then choose their data for each line: $30/month for unlimited data on smartphones or $10/month for unlimited data on basic phones. Additional options include $20 for 1GB of data on smartphones or basic phone users can choose not to add data to their account. - Customers also have the choice to activate mobile hotspot functionality on their smartphone for $10 per month for 1GB of data on the Sprint network. Sprint's My All-in plan offers unlimited talk, text, and data plus 5GB of mobile hotspot usage for $110. With both plans, customers are guaranteed to have access to unlimited talk, text, and data for the lifetime of the line. Previously, Sprint's individual unlimited talk, text, and data plan was priced at $109.99, so the change marks a significant discount. The pricing shift comes just a day after T-Mobile announced its new "Jump" phone upgrade program, which allows T-Mobile customers to upgrade their phones as often as twice per year. According to Sprint, its customers save $240 per year over Verizon customers, and $120 per year over AT&T and T-Mobile customers. Sprint's new plans will be available beginning on July 12, and its new guarantee will go into effect on the same day. What I love about plans like this is it starts to reshape the industry. Over time, the other Networks (at&t & verizon) have to start being more competitive. They may not offer the same plans, but they typically offer more aggressive plans to give customers pause before seriously considering moving over to sprint. OMG, thats a heck of a deal! It's Sprint. Meh. next please. Sad to see what Sprint has become these days. However, I do not know 1 person with Sprint who likes their service. I have more trouble with undelivered texts and calls not ringing through to the phone with Sprint customers than anyone else. now I live in OK and the problems are the same. Unlimited service is useless if the phone won't work. Ladies and Gentlemen, this is why competition is good. Regardless of Sprints service, at least the "big four" are throwing down. Thank god the AT&T and t-Mobile merger was blocked. It's good to see competition between carriers. Maybe some day there will be a carrier that doesn't screw the customer over. Well this isn't particularly great because its Sprint....but I hope it will inspire competition and maybe one day we might see prices/cool extras that reflect european carriers.